Welcome to the concise graduation guide for Parris Island Marine Corps Recruit Depot. This is an exhilarating	experience in the life of your Marine and we strive to provide you with the most complete graduation information available for Parris Island Marine Corps Recruit Depot. 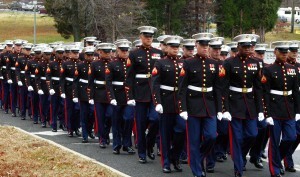 Graduation schedules and events are published below to aid you in scheduling your attendance at your Marine's graduation. You will find many cost effective options for traveling to Parris Island Marine Corps Recruit Depot. You will be able to review the complete details on the many hotels available to meet your lodging needs. The greater Parris Island Marine Corps Recruit Depot area provides many options for dining ranging from fast food to full service restaurants. Parris Island Marine Corps Recruit Depot is located on the east coast of South Carolina. Click here for more information on air, bus, and train transportation for Marine Corps Recruit Depot. Due to security measures that are in place at Parris Island Marine Corps Recruit Depot you may experience delays getting onto the Depot. Be sure to allow for extra time to make sure you arrive at the graduation event on time. During your recruit’s ninth week at Parris Island Marine Corps Recruit Deport (MCRD), your recruit will send home an informational letter that contains very important information regarding graduation, including your recruit’s graduation date and the vehicle pass for the base. What to wear to a graduation ceremony? Your Marine will be dressed in a seasonal service uniform and military guests are asked to either wear their service equivalent or dress uniform. Conservative attire is recommended for the civilian guests. Immediately following the conclusion of the graduation ceremony, new Marines are free to leave Parris Island and begin their 10 days of leave. There are no animals allowed at the Graduation. The only exception is for service animals. Cell phones are not allowed in use while driving unless you have a hands free connection. Seat belts are required and strictly enforced. Basic Training graduations from the Marines are conducted every Friday. For complete graduation details and schedule of events please click here.